WEATHER ALERT: SEVERE STORMS AHEAD. Gemma and Hallie's world has come to a screeching halt. Their parents are engaged, which makes them step-sisters. Nothing in the world could possibly be worse for Gemma and Hallie--they won't let it happen. Even if it means putting their own feud aside to separate their parents. Events quickly escalate as a hurricane rips through the Hamptons leaving everyone (including Gemma's two exes, her current crush, best friend, and her nemesis) bottled up in one house. One big, miserable group of exes and enemies together allow secrets to unfold and plans to be plotted. The calm before this storm definitely doesn't exist. 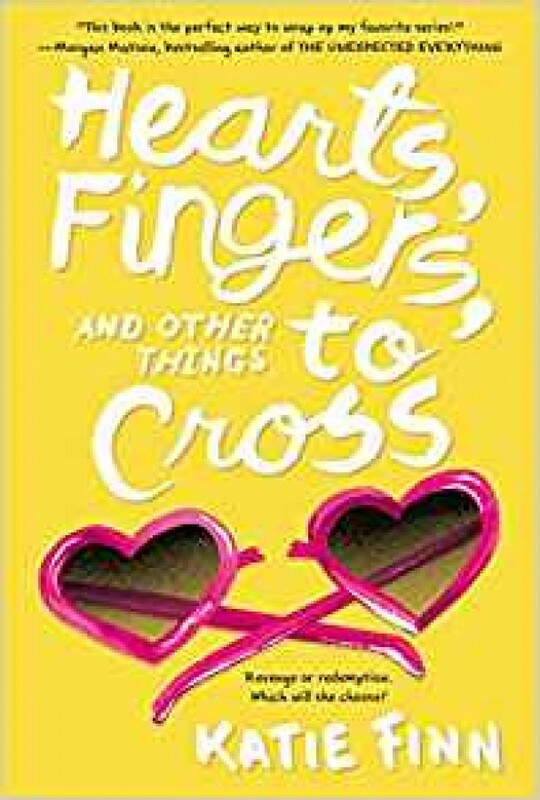 Katie Finn pulls out all the stops for this fast-paced, romance-revenge novel, Hearts, Fingers, and Other Things to Cross, the dramatic conclusion to the Broken Hearts and Revenge series that began with Broken Hearts, Fences, and Other Things to Mend and Revenge, Ice Cream, and Other Things Best Served Cold.